media.ccc.de - Playlist for "28C3: behind enemy lines"
Playlist "28C3: behind enemy lines"
Towards a Single Secure European Cyberspace? The "European Great Firewall" was the way that European civil rights organizations has addressed the proposal to create a "single European cyberspace". Surely other lectures will describe the technicalities of the proposal. 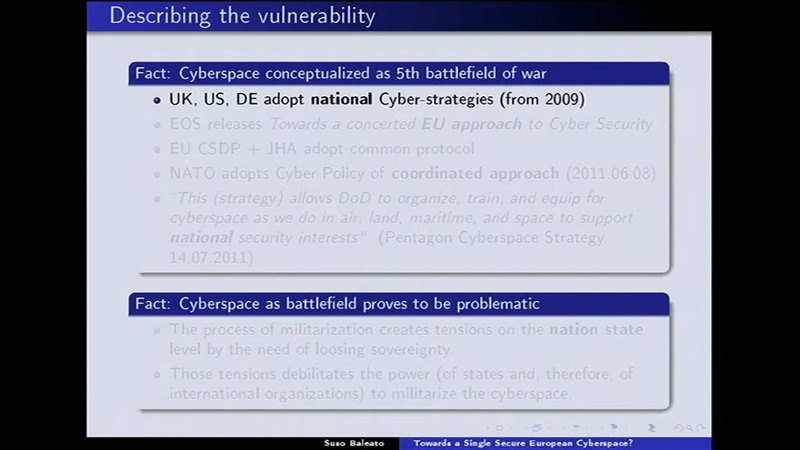 This lecture will go beyond that, describing a vulnerability that the proposal reveals in the power structures of the European and world governance, that could be exploited by the hackerdom if the war is understood as a value to be avoided.